A “capstone” is an architectural term: it is the final block or section placed on a construction project to complete the structure. Coincidentally, each layer of brick in a building is called a “course,” so it’s appropriate that a Capstone project, a culminating and highly individualized academic and intellectual experience, was instituted this year in Mr. Inouye’s English 12 classes. Capstone projects are typically long-term investigative projects that lead toward final products (e.g., websites, poster sessions, formal presentations, etc.) that are shared with a small or large community of peers and, sometimes, teachers, parents, and other guests. Using a process called “I-Search” (a term coined by Ken Macrorie), English 12 students this year began by reading a nonfiction book of their choice in a subject area of their choosing — something that they’d be interested in researching for an extended period of time — and hopefully something that sparks their curiosity, or something with multiple viewpoints or both. They reflected on what they already knew and thought about their chosen area, completed mini-research on who the possible stakeholders (alive and dead) in the issue are, and developed a major question or questions that would drive the I-search. Here’s where the “I” in “I-Search” comes in, then: The students then, according to Huntington Lyman, “[tell] the story of the search in a first-person narrative, explaining the route taken to ﬁnd information and answer important questions, recording the way the central question evolves and changes.” In this way, the I-Search essay encourages critical thought and requires it to be made explicit. Students narrate their search, reflecting on the revelations and epiphanies they have, as well as the roadblocks they encounter or the mistakes they make along the way, thereby gaining a greater sense of the complexities and possibilities of any kind of investigation or problem-solving. The concluding section gives the student a chance to synthesize what they’ve uncovered within the time span of the project — and the concluding product (and how it will be shared) remains the question for 2015. This year, the students created their own public websites to house and augment with visual media their year-long investigations. 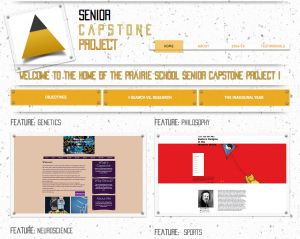 You are invited to learn more about the Senior Capstone and peruse the students’ websites and research by visiting the Senior Capstone website. You are in for a real treat of intellectualism, inquiry, and innovative thinking. Some rising seniors have already begun thinking about their Capstones for next year! They’re planning to investigate questions and problems in mathematics, special education, and philosophy. Their enthusiasm on the eve of Junior exams is a good sign!